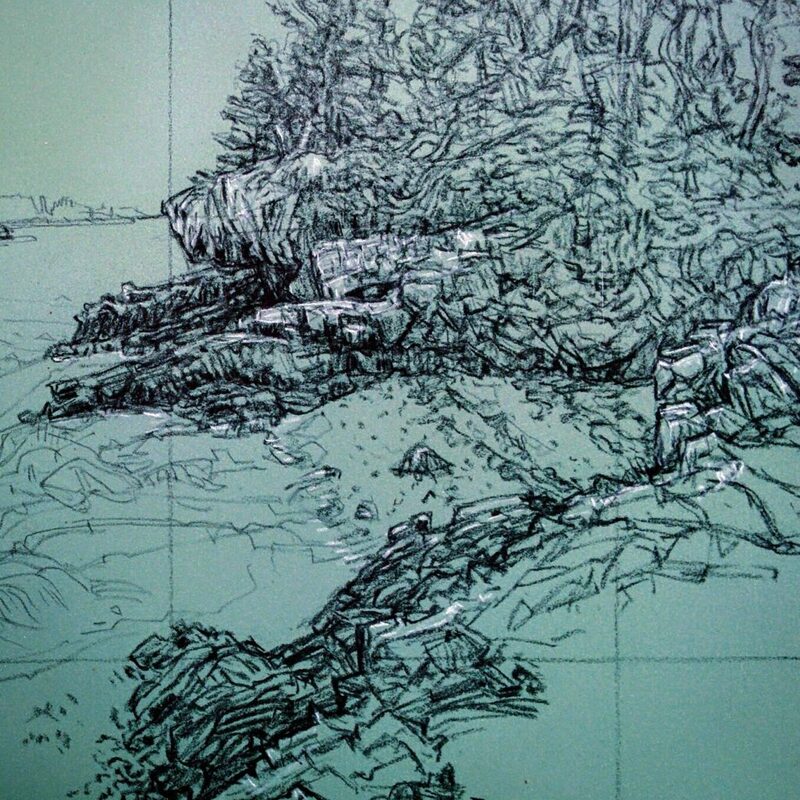 I recently spent some time on one of the hundreds of islands in Penobscot Bay. 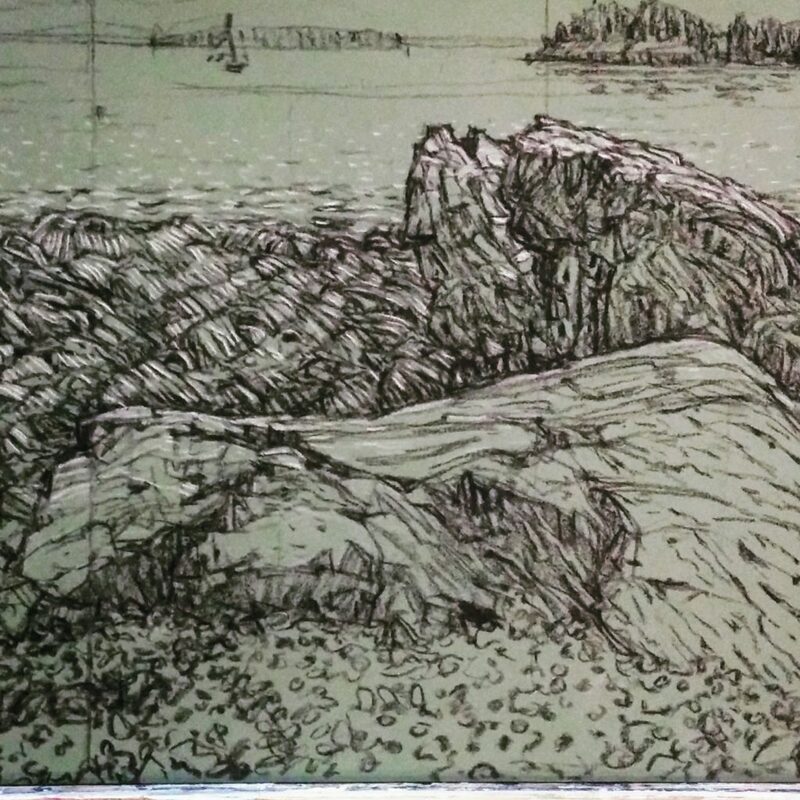 It was wonderful to have a chance to work on site in that beautiful landscape of rocks and water. 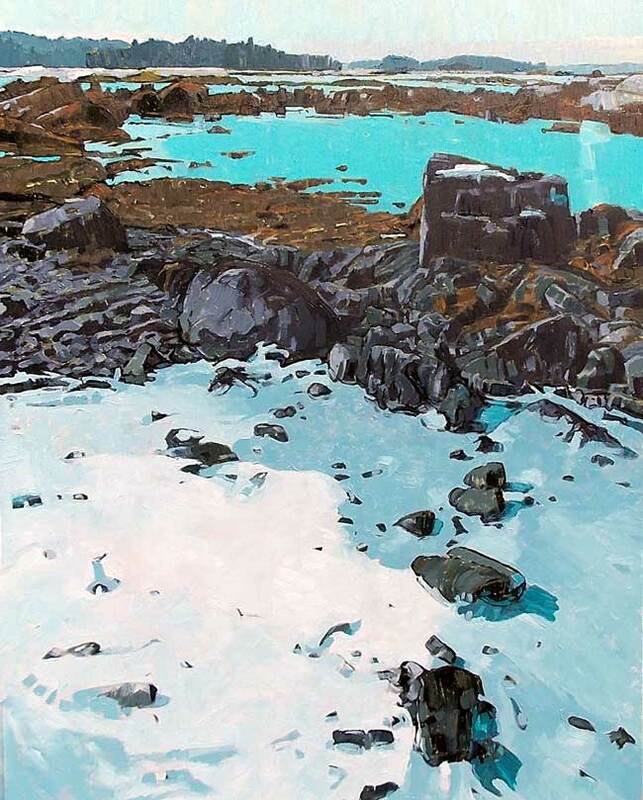 Drawings are Coates brand vine charcoal and white Conte crayon on Ampersand pastelbord, and are all approximately 20 x 16 – big enough to encompass the view and small enough to securely carry over those rocks! 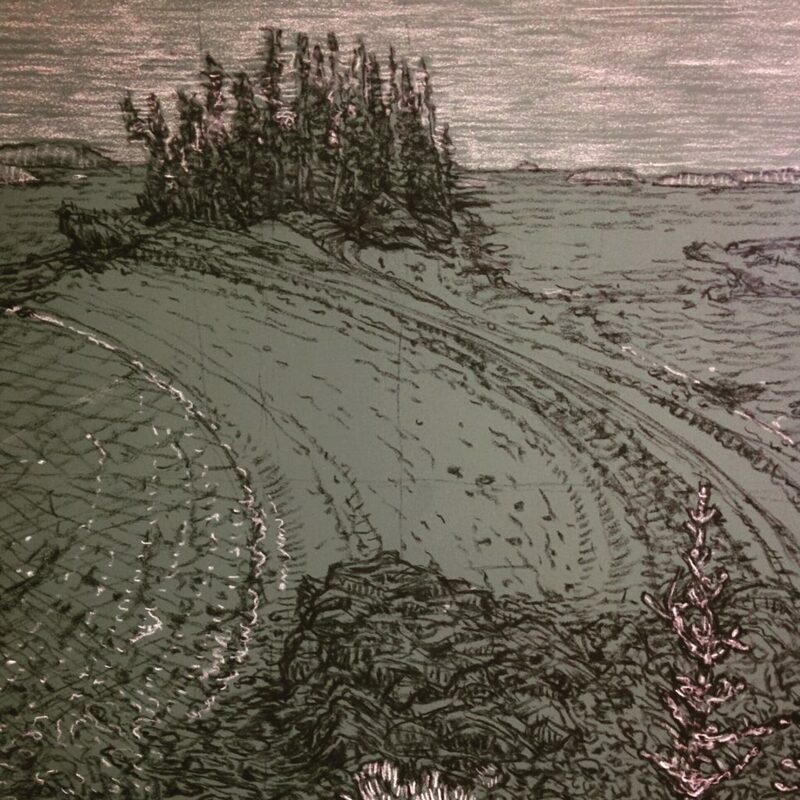 This entry was posted in art, Great Spruce Head Island, landscape, Maine and tagged drawing, island, landscape, summer on September 28, 2018 by APo. In the photo below you’ll notice a heap of garden refuse (the hugel) in back of a trench dug below grade planted with kale and bok choi varieties (the waffle). Hügelkultur is a composting process using raised beds constructed from decaying wood debris and other compostable biomass plant materials. 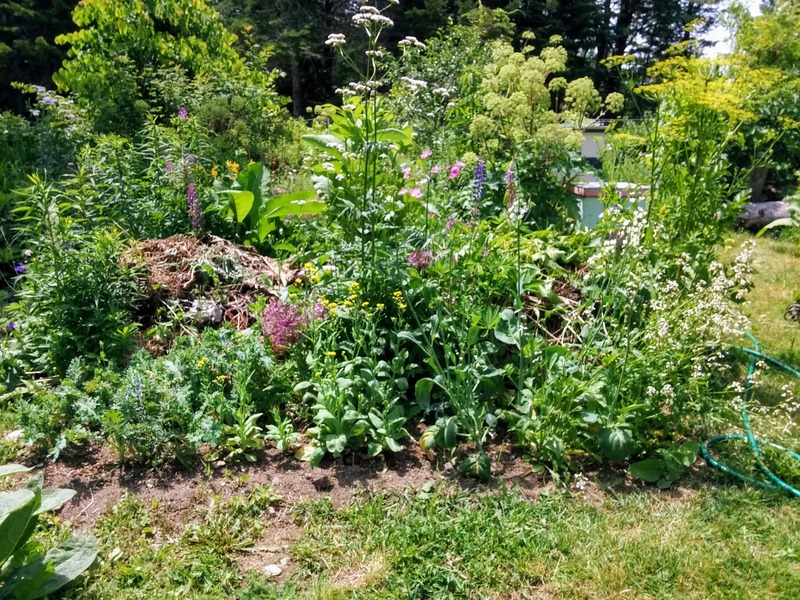 The process helps to improve soil fertility, water retention, and soil warming, and improves the insect and bacterial life of the beds around the hugel. Building several hugels around the garden makes a handy depository for the constant outflow of pruning and weeding debris, making it much easier to “compost in place”. I use the top and sides of the pile to stash plants that need a temporary home; clumps of daylilies that needed separating, unexpected plum seedlings, and the like. The top of the pile dries out in my very arid Downeast summer weather so I don’t plant vine crops or flowers there, although many people recommend the practice. Someday, when I have more water available perhaps that will be an option! The hugel is paired with a waffle bed. 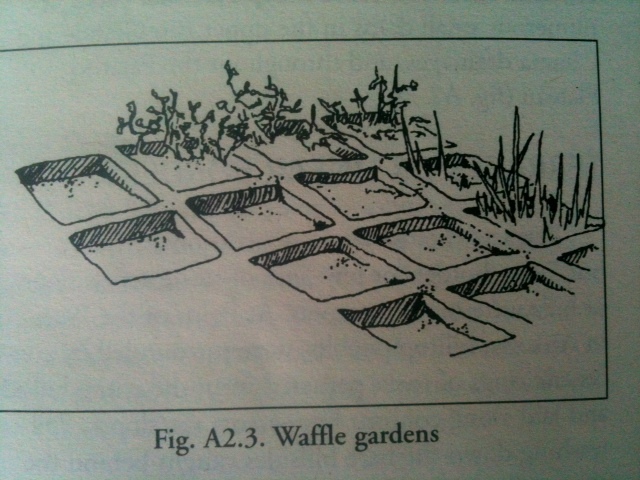 Waffles are the opposite of raised beds and are built by removing soil in a small area, replacing and augmenting the best soil available, and then planting below grade. This practice has been used since ancient times in arid climates to preserve water and soil, and to shade roots and seedlings as they develop. The combination of the hugel acting as a windbreak, moisture reservoir, and beneficial critter refuge with the waffle offering fertile soil, bottom shade, and slower evaporation, is hard to beat. The hugel/waffle combination can be quite small and still provide a significant benefit. Here a small hugel on a slope is planted with Marguerite Daisy (Argyranthemum frutescens). Note that this plant is generally considered a weed for it’s prolific seed production but is also a good drought proof pollination plant. The trenched waffle bed upslope is planted with onion sets, and the small, deep waffles below are planted with tomatoes. Both sides benefit from the hugel providing water diversion and storage and wind protection. 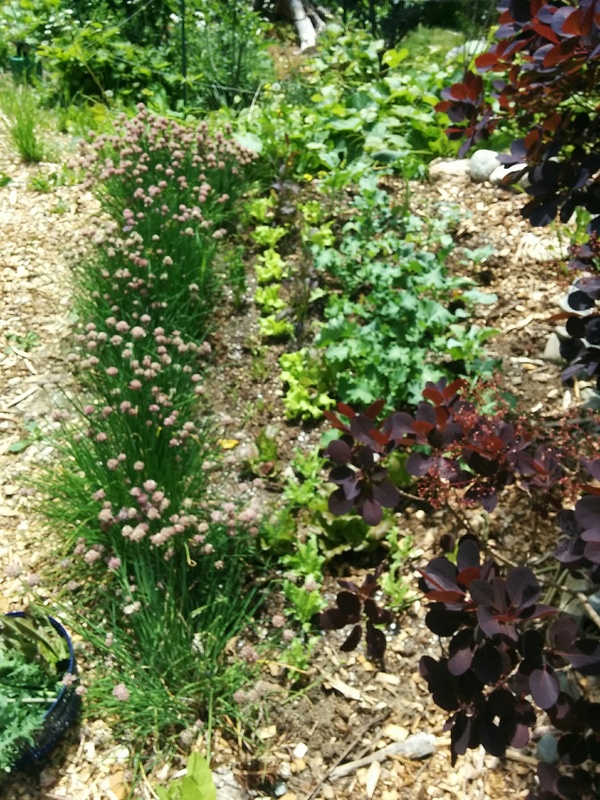 Here a small hugel planted with chives borders a waffle planted with greens: kale, Australian yellow lettuce, spinach, and lettuce var. Pablo. For those of us with poor soil in an arid climate, just a little digging can make a big difference. 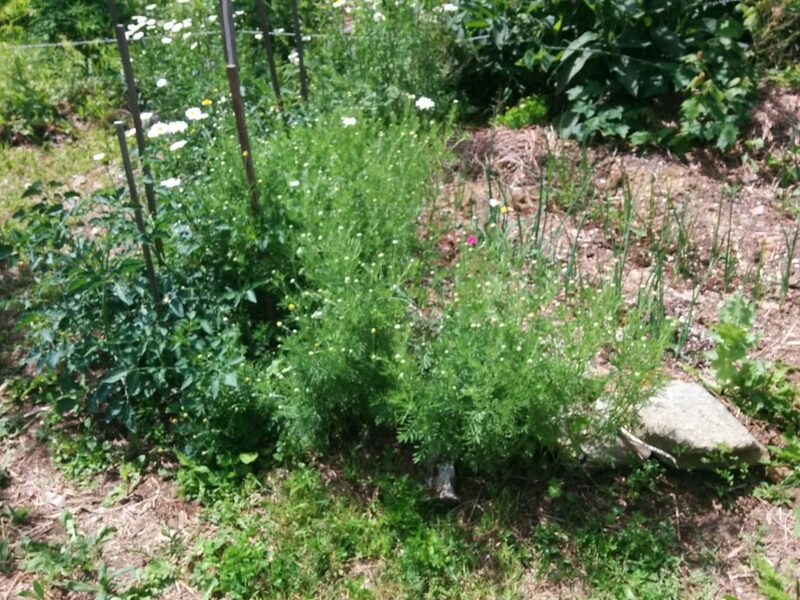 This entry was posted in gardening, horticulture, permaculture, the backyard, vegetable garden, Waffle Beds and tagged garden, landscape, summer on July 5, 2018 by APo. I need to do a follow up post on waffle beds in the garden, possibly another on the new hive of bees, and I still haven’t planted out the spinach. On the other hand, my studio time has been very productive (and the spinach seeds can wait another few days). 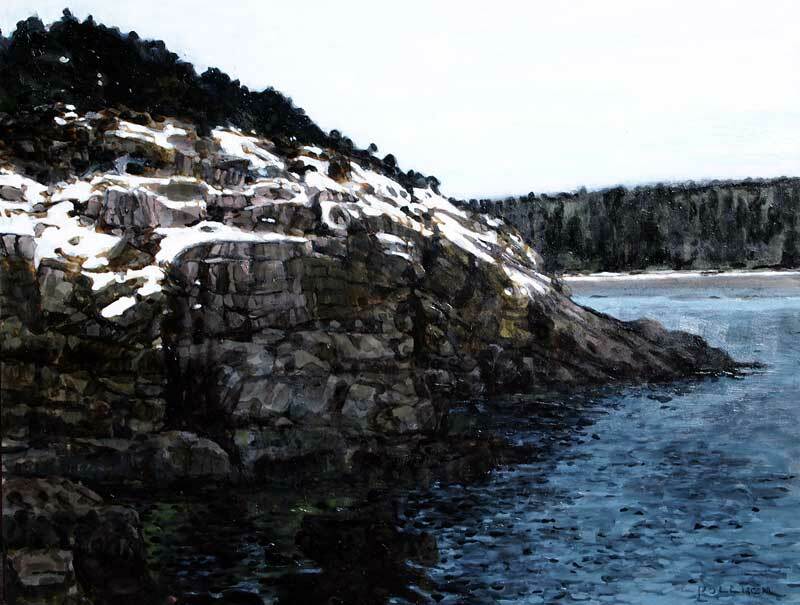 This entry was posted in Acadia National Park, art, landscape, painting and tagged Bar Harbor, landscape, painting, spring on May 22, 2016 by APo. On day last October I meandered down the coast and finally settled on a view across the harbor to the Town of Stonington in the late day sun. It was cool and clear and I managed to dodge the group of photographers with HUGE lenses who were also hunting for the perfect light; that trophy view of little white structures gamely climbing the hill above the ocean. Many thanks to the Stonington Free Library for providing shelter and a place to check my email. The librarian was endlessly patient with folks who couldn’t remember the last name of the author (Wilder) or the title of that series about Merlin (which turned out to be the Arthurian Saga by Mary Stewart). It was a wonderful day. 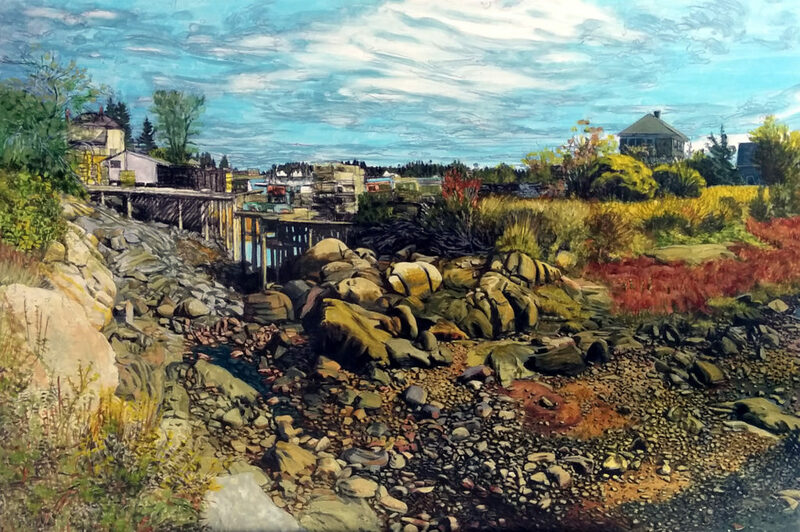 This entry was posted in art, landscape, Maine, painting, Travel and tagged architectural landscape, autumn, landscape on December 20, 2015 by APo. 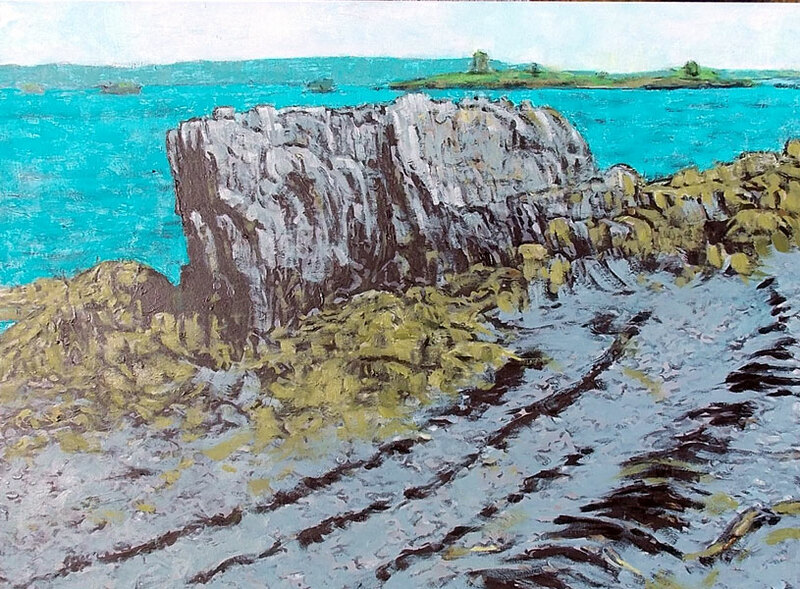 This entry was posted in art, Great Spruce Head Island, Maine, painting and tagged landscape, painting, summer on October 16, 2014 by APo. This site has been very, very good to me. . .something about the stacked layers of rocks and water going straight out to the horizon that is visually compelling. Right now in late June and just past the longest day it’s like a desert down there on the rocks, but I took a long hike along the shore on Mother’s Day when the snow still extended down to the water’s edge and made the start to this painting. By popular request, here are some details. 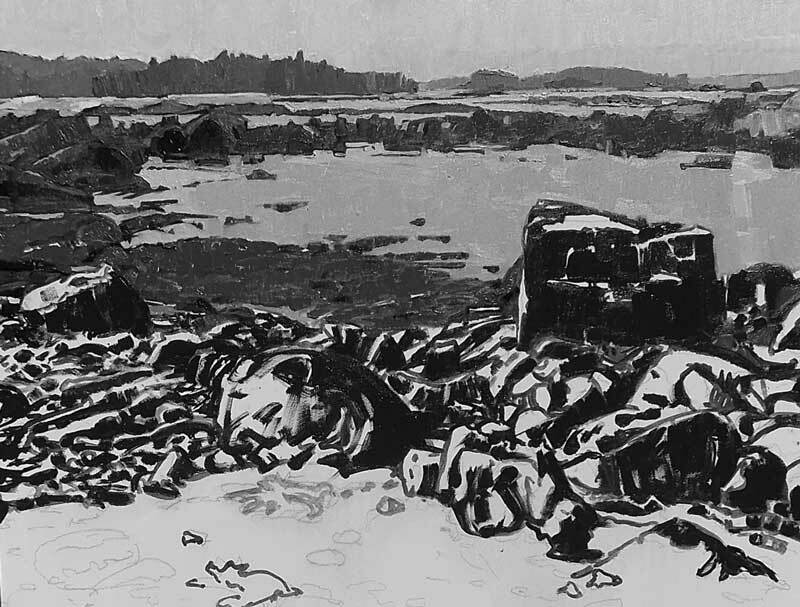 . . the far reaches are under water at high tide and are covered in rockweed and barnacles, turning them a lovely warm sepia color even in the dead of winter. 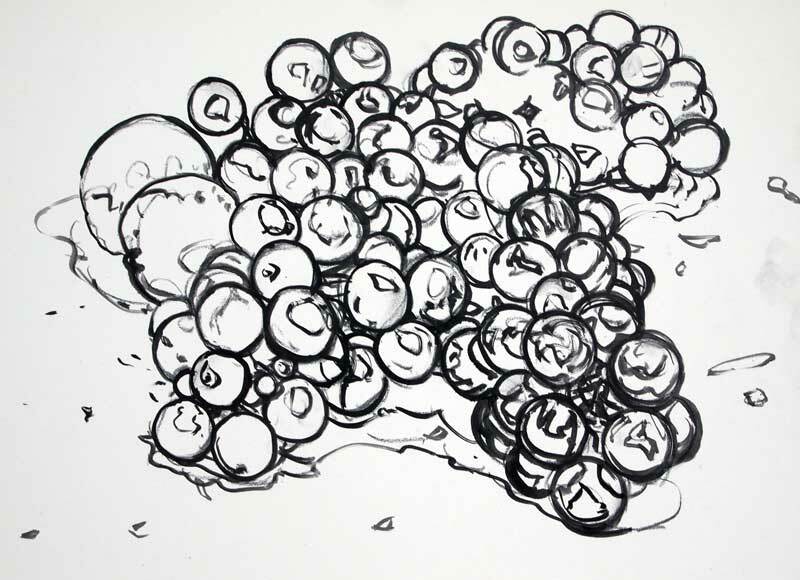 And finally, the drawing stage from the site. This is Ivory Black oil on a tinted board. 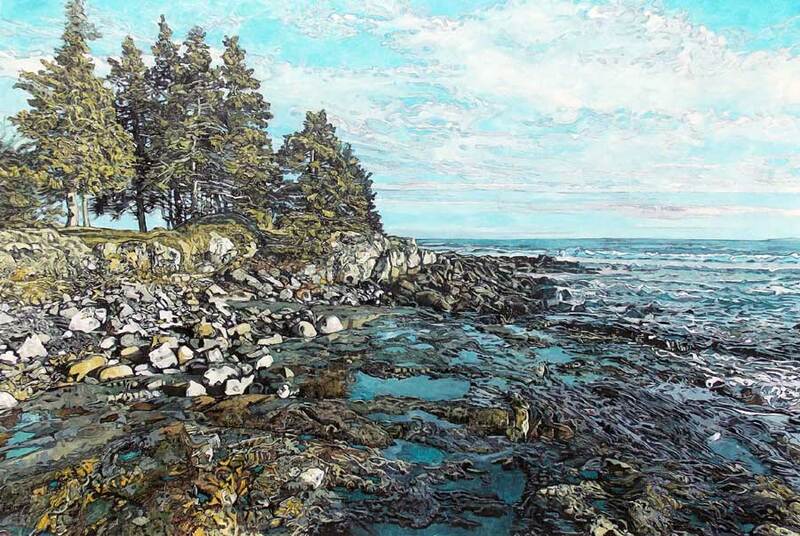 This entry was posted in art, landscape, Maine, painting and tagged drawing, landscape, ocean, painting, spring on June 27, 2014 by APo. 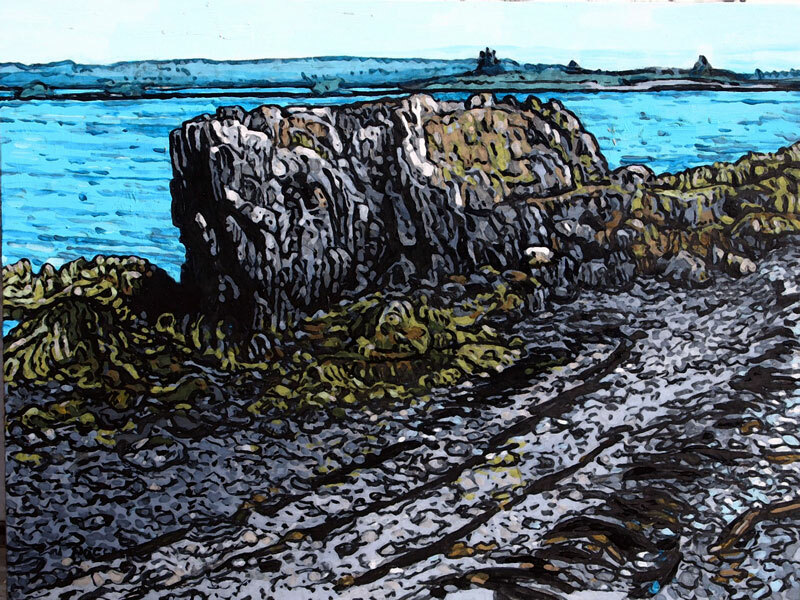 Last summer I was able to spend a week painting on Great Spruce Head Island. 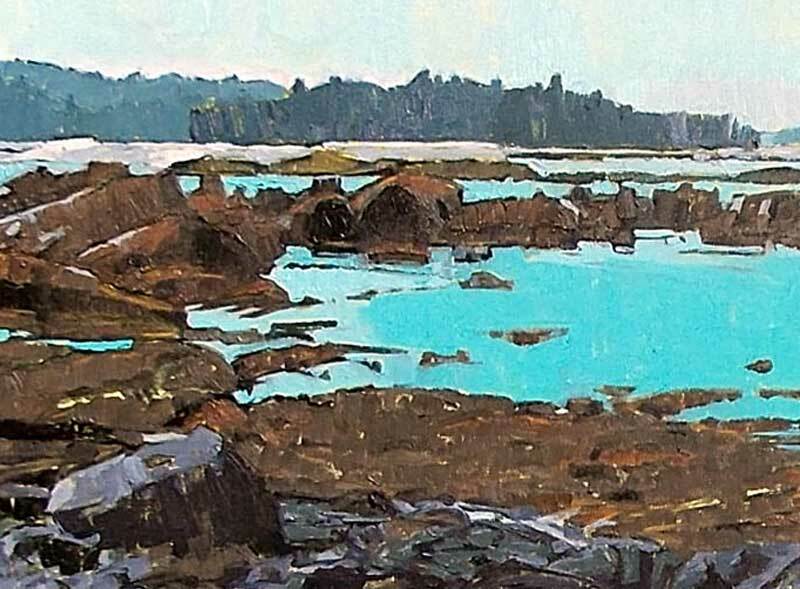 This is a small piece based on studies and photos of a rock at the end of the Double Beaches: 12″ x 16″, oil on panel. This entry was posted in art, landscape, Maine, studies, Travel and tagged landscape, painting on January 24, 2013 by APo. Two weeks ago I posted a new work-in-progress and then the site went down for a few days and I never posted the finished piece. Here it is with additional detail and the final glaze in Ivory Black. 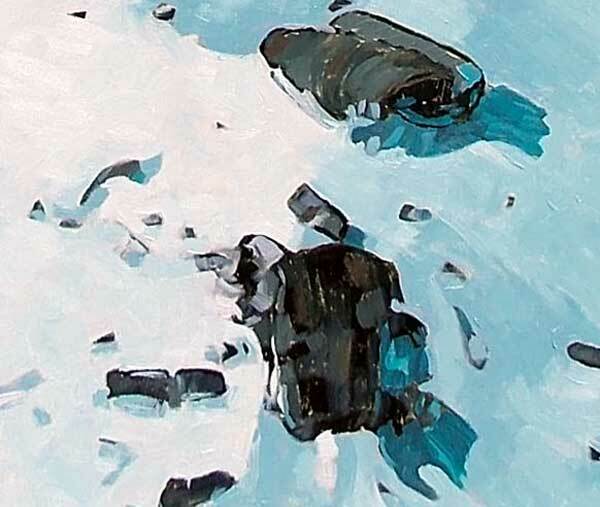 If I’d given more thought to the process of changing from pastels to oils after all this time I would have started with studies – small pieces with discrete subject matter as exercises – rather than full on painting subjects. 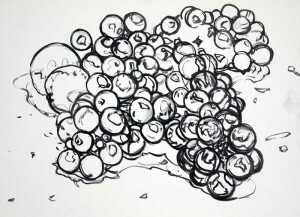 This is the first drawing, in brush and ivory black, for a series of still life studies featuring grapes and the occasional red plum. I think they will be very educational. 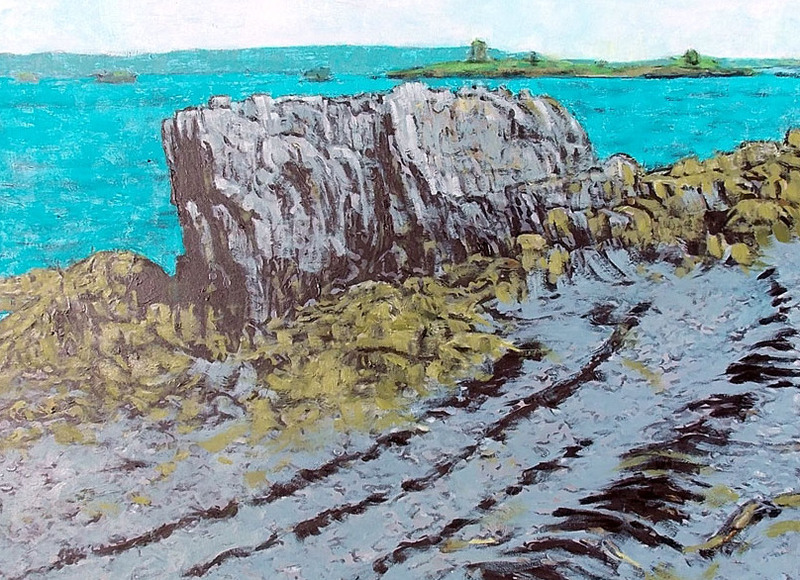 This entry was posted in art, landscape, meta, painting, still life, studies, work in progress and tagged landscape, painting, still life on September 23, 2012 by APo.